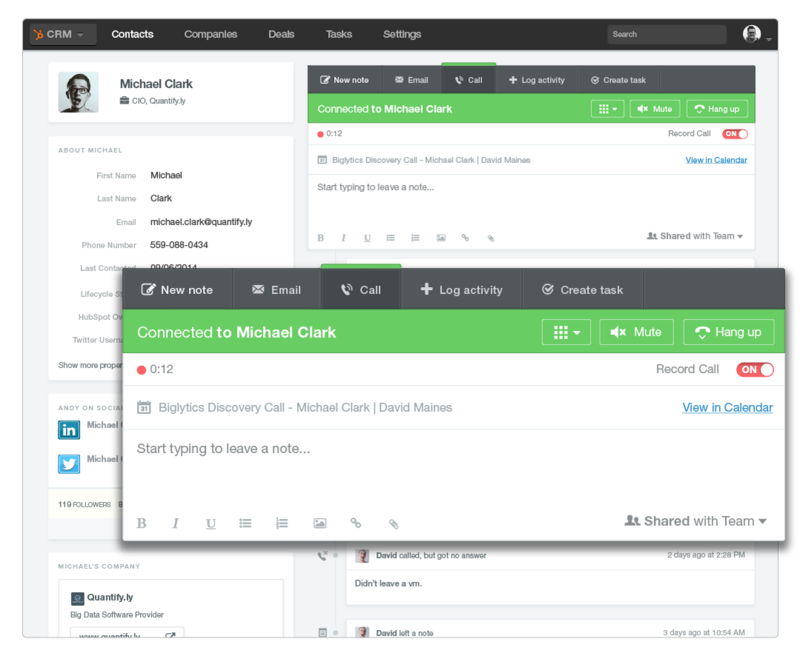 Is HubSpot’s CRM Living Up To Its Promise? As I shared in a previous post, sales enablement/acceleration technology is one of the fastest growing categories there is today. Everyone is trying to figure out how to increase efficiencies, improve productivity and enable salespeople to spend more of their time selling. The challenge with a lot of the technology is that it requires you to use several different systems/platforms to get the job done. While each piece of technology may in fact be an accelerator, making them work together can create more frustration than existed before the technology was put in place. I know companies that are literally using seven different platforms to run their sales efforts. While the new CRM doesn’t do everything available, I’ve yet to find one platform that does so much, so intuitively and easily. In September I commented that this was a CRM built with the salesperson in mind. I’ve now been using the system for five months, and I can unequivocally say that I’m more productive when using it and it’s easier to keep things on track. While the system is built for the salesperson, the sales manager doesn’t suffer in the process. It is easy and intuitive to be able to keep track of what reps are doing, how well they’re doing and what areas to focus. In many ways it’s actually easier because sales reps will naturally keep the CRM up-to-date. You could not control who had access to contacts and records, meaning that if you had multiple salespeople you had to trust that nothing would get messed with. It lacked any type of reporting capabilities (more on that below). The ability to track activities and other items was somewhat limited. Historically, one of the main propositions of CRMs was to ensure compliance with company policies and processes, and the system wasn’t particularly effective for that. With the exception of reporting (which has improved), the drawbacks have been addressed for the most part. Today, any company that is not firmly entrenched with their existing CRM or utilizing the vast majority of capabilities from Salesforce.com should give serious consideration to switching. We’ve worked with several clients who have switched and the process has been relatively painless, with upticks in productivity occurring almost immediately. Calling capability: this feature requires the premium version (which does have a fee), but in and of itself it is a home run. We’ve used autodialers and calling platforms in the past, and increasingly we’re finding that HubSpot’s platform excels (especially for reps whose primary job isn’t pure outbound dialing). With the calling feature I’m able to make a call with one-click. I can make the call from my browser, or I can have it connect to my phone, so if I don’t have a good Internet connection it’s not a problem. I can record the call if desired (and allowed), and with one click the fact that I made the call is stored in the system. Additionally I can create a call que. So when I’m working on following up with my Inbound leads or companies that are in my pipeline, I can easily group them together, block off some time and make my calls, without ever touching a keypad. Email & Templates: I can further enhance the productivity and effectiveness of my sales team by creating a series of templates that can be used by reps for repeatable situations. So, when I’ve left a voice mail following up on a lead I can select the follow up email appropriate to where they are in the process, and send it with minimal typing and time. Additionally, by using Sidekick, I can integrate with Outlook or Gmail. All of my templates are there and a click of a button synchs the email with my record in the CRM. This means that I’m still using the CRM when I’m in my email reader, and I don’t have to think about what I’m doing (or what I did) to keep things up-to-date. Prospect Intelligence: With Sidekick integrated into the CRM and my browser, I’m able to quickly get important intelligence about a company. Whether it’s identifying the people I should be talking to, the size of the company or similar companies, it’s all right there. With a single click I can have the information synched into the CRM. This enables me to cut down the time in research when I’m calling; and as a manager to be in a stronger position to coach my reps. Integration with HubSpot Marketing Platform: The first benefit here is that immediately all sides of the house (marketing and sales) know what’s happening with every prospect or customer. No synching required – it’s all using the same database. The real power comes in the ability to empower both marketing and sales at the point of implementation. For example, I can create automated workflows to implement a campaign geared to address specific issues within the sales process (ie. to address an area of resistance). The moment a sales rep records that resistance I can either have the workflow implemented automatically or I can put it in the hands of the sales rep to determine if the campaign would make sense. This enables the alignment that is so important between marketing and sales to be reinforced. The Deal Dashboard & Pipeline Tracking: Keeping track with where things are in the pipeline and how deals are progressing is done in a flash. I don’t have to program arcane reports and I can quickly zoom down from a company to the individual or product perspective to assess and forecast the pipeline. Reporting. As I’ve already mentioned the reporting capabilities are still minimal. Additionally, if you want offline reports it’s virtually non-existent. 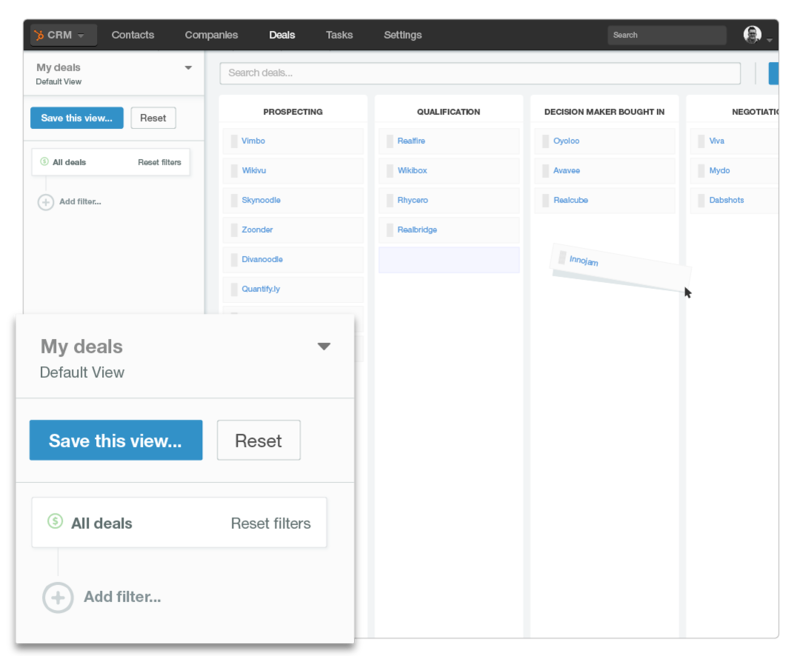 For example, while I love the pipeline tracking and deal dashboard, it’s only viable to look at online. If I want to print out a pipeline report I have to take a screen shot. Administrative Controls & Customization. Right now every individual that is using the CRM needs to customize it to how they want to view. I can’t dictate the look and feel in advance or design it for certain roles. Additionally, the rules that can be created are limited, reducing the viability of the CRM for companies that have lots of products and different sales roles. The most exciting thing about working with the CRM these last five months is seeing the improvements that are consistently being made. I have no doubt that with the next seven months several more enhancements will be added. That said, even with the improvements needed, you should give the HubSpot CRM a test-drive; who knows…you may come to love your CRM as well.